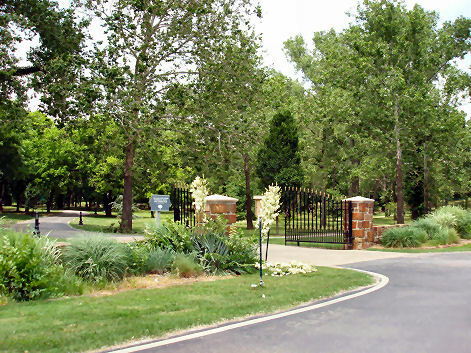 Washington Irving Memorial Park and Arboretum, a 32.5 acres public park and arboretum, is located just north of the Arkansas River Bridge between 131st & 141st Streets on South Memorial Drive in Bixby, Oklahoma. The park is named in honor of American writer, Washington Irving, who camped in the area in October 1832 while participating in a federal expedition to the American West led by Judge Henry L. Ellsworth of Connecticut. The expedition included a 31-day, 350-mile circular tour of central Oklahoma. The park contains a wooded walking trail, the Laci Dawn Griffin Hill butterfly garden, and memorials to the children of the Alfred P. Murrah Federal Building bombing and to the September 11, 2001 attacks. It also contains a statue of Irving seated on the porch of a replica of his home, Sunnyside at Tarrytown, New York. Washington Irving Memorial Park Foundation, Bixby OK.